Woman's Club of Erie | Book a party at our clubhouse. 4/9/19 – Lunch & Guest Speaker Series – Noon – Menu: vegetable soup & salad topped with grilled chicken. Fee: $12.00.1:00 p.m. – Lynn Rupp, UPMC Hamot VP of Operations, speaking on Latest Innovations in Health Care. RSVP: Elaine Heiden at 814-440-4330 or eheiden45@gmail.com. Click here for Women’s Day invitation. Click here for Women’s Day Sponsor Letter to learn how you can became a sponsor. 4/15/19 – Pittsburgh & The Birds – $159.00 – Includes motor coach transportation, all meals, fees and tips. Tour and attend a special program at the National Aviary and watch a parrot paint. Tour four floors of exhibits at the Heinz History Center including the recently installed Mr. Roger’s Neighborhood artifacts. Enjoy dinner (choice of Maryland Crab Cakes or Sirlion Steak – vegetarian entree available upon request) at the Grand Concourse in Station Square. For reservations, send check, made payable to the Woman’s Club of Erie, to Marci Cashman, 2906 North Birch Run, Erie, PA, 16506 or phone 814-450-3199 for credit card availability. Reserve your spot with full payment. Thank you to all who participated in the Erie Community Foundation’s Erie Gives Day 2018. The Woman’s Club of Erie is grateful for this wonderful opportunity and to all who consider our Raise the Roof Campaign a worthy cause. The Woman’s Club of Erie was selected as one of the six 2018 Great Erie Awards by Preservation Erie in the Preservation Excellence Category. For the past six years, Preservation Erie has been recognizing local businesses, individuals and organizations that embody their mission to promote, preserve, and enhance the distinctive character of greater Erie through community-based planning, design, and historic preservation. This year’s 2018 Great Erie Awards recipients were recognized during the annual Greater Erie Awards presentation at Jr.’s Last Laugh on Wednesday, April 25. 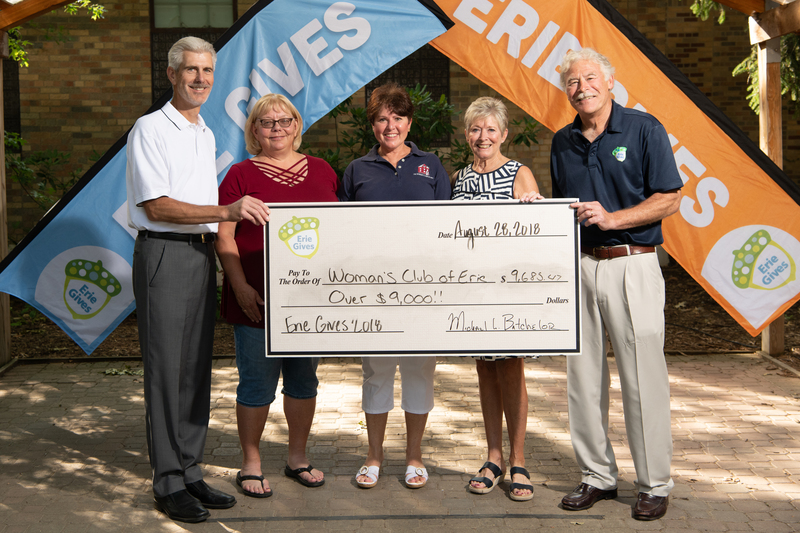 Treasurer Marci Cashman, Grant Writer and Member Melinda Meyer, and President Judy Husted attended September 14 news conference at the Erie Zoo for the purpose of receiving the good news that the Woman’s Club was chosen as one of the Community Assets Grant recipients. The grant award of $6,522 will be applied to the tuck-pointing estimated at $21,480.00 for the Clubhouse. 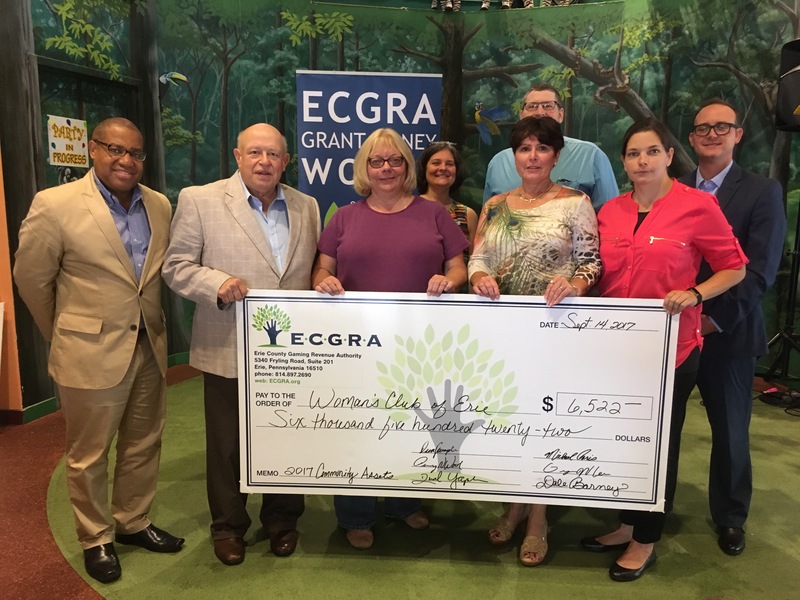 Pictured left to right are Gary Lee, Erie County, Dave Sample, ECGRA Board, Treasurer Marci Cashman, Member Melinda Meyer, President Judy Husted, Mike Paris, ECGRA Board, Ashley Lawson, Gannon University, and Perry Wood, ECGRA Executive Director. Nine (9) years ago, the Woman’s Club of Erie began a gradual repair and replacement program on the roof of their 125-year-old clubhouse, the former Davenport and Winifred Galbraith mansion located at 259 West Sixth Street. The mansion was built at a cost of approximately $60,000.00. Located in the historic area on West Sixth Street between Perry Square and Gridley Park, it was selected and given “Significant” status in September 1984. Initially, Northwest Restoration, Inc. was hired and began repairing the channels and internal gutters (that run in the eaves), and replacing missing or broken red slate tiles. The red slate tiles are harder and more durable than the more commonly used gray slate, thus more expensive. 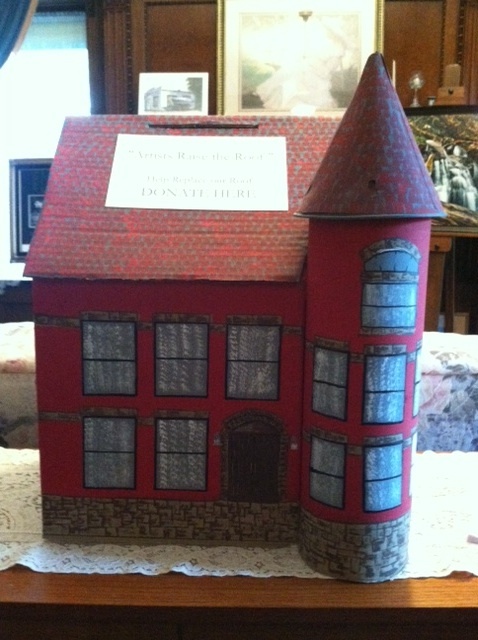 A cardboard miniature of the mansion created by Steve Giewont and decorated by Lainie Addessi is on display and available to receive roof donations. Individuals can sign a paper tile and adhere it to the roof of the miniature. The General Federation of Women’s Clubs (GFWC) is an international women’s organization dedicated to community improvement by enhancing the lives of others through volunteer service. GFWC members are in every state and more than a dozen countries. Their goal is to promote civic involvement in their communities, advancing education as well as preservation of the arts and culture all the while promoting healthy lifestyles. The GFWC owes its beginnings to Jane Cunningham Croly, a professional journalist who in 1890, due to her gender, was denied admittance to a dinner at an all-male press club honoring Charles Dickens. This spurred her to form the famous women’s club, Sorosis – a “centre of unity” that had neither a charitable nor socio-economic purpose, but sought “collective elevation and advancement.” As women’s clubs began forming across the country, they became a center of educational advocacy and a sort of college for older women who wanted to learn. 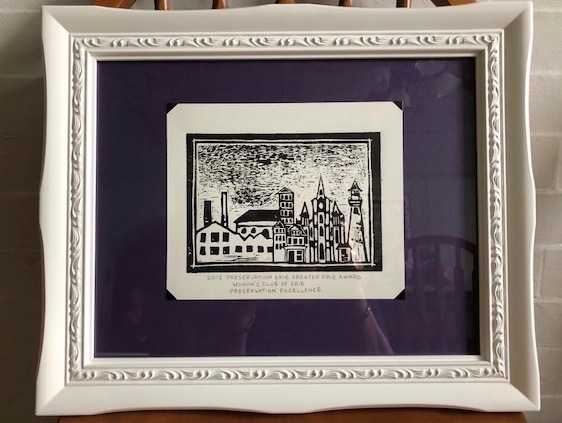 Croly formed the General Federation of Women’s Clubs in 1890, to support clubs throughout the nation and further their efforts at providing education, improved working conditions, health care, scholarships and other reforms. Today the GFWC boasts over 100,000 members. 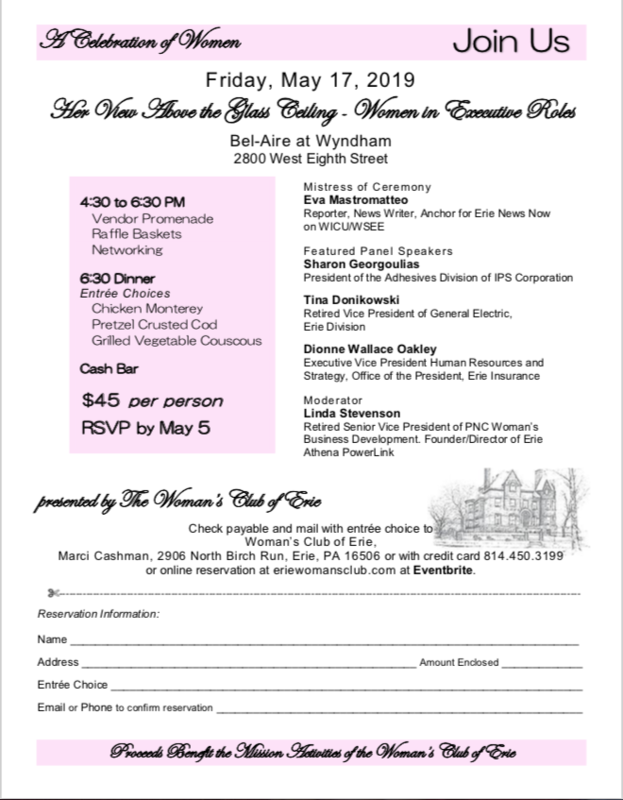 The Woman’s Club of Erie is a 501c3 philanthropic organization that aims, through its various fund raisers, dinner and speaker series, to improve the lives of women and children in the Erie community. The Woman’s Club of Erie began in 1897 and was federated in 1898. Since its beginnings, the organization has been a champion to numerous civic causes in the Erie community, i.e., the founding of the Visiting Nurses Association and the Erie Unit of the American Cancer Society in 1945, donating to the Juvenile Diabetes foundation, Shriner’s Hospital, the Second Harvest Food Bank, House of Healing, Erie DAWN, Erie Zoological Society, Inner-City Neighborhood Art House, The Humane Society of NW PA, The Caring Place and Safe Net–a temporary shelter for abused and displaced women and their children–just to name a few. The mansion, purchased in 1921 from Winifred Galbraith, who was also a Woman’s Club member, is currently utilized as a meeting place for members.